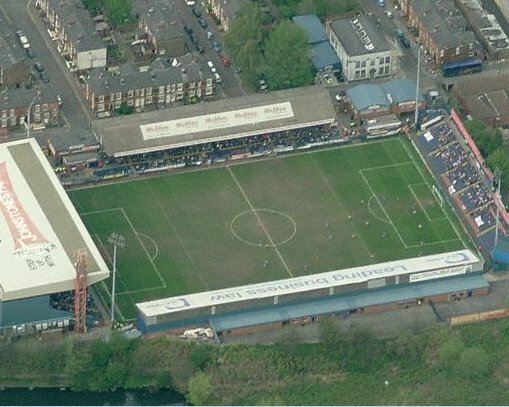 Take an aerial tour around Edgeley Park (requires Google Earth). 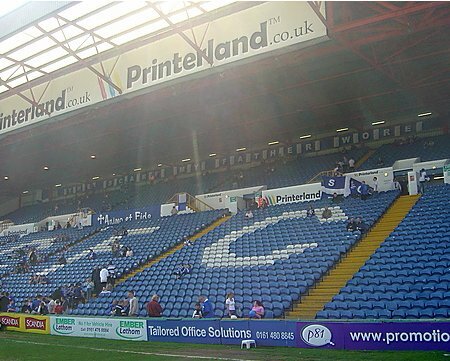 Away fans are located in the Railway End. Usual ticket allocation is 1558. The Popular Side can also be used if there is demand giving a further 800 seats. Exit the M6 at Junction 19 (sign-posted 'Manchester Airport, Stockport A55, M56 East') and at the roundabout turn right onto the A556. At the Bowden roundabout after 4.2 miles, turn right (sign-posted 'Manchester M56') onto the M56 motorway. Exit the M56 motorway after 6.9 miles (sign-posted 'Stockport M60, Sheffield M67') onto the M60. Exit the M60 at Junction 1 (sign-posted 'Stockport Town Centre'). At the roundabout, follow signs to 'Cheadle A560' also 'Stockport County FC' into Hollywood Way. Go straight on at the first set of traffic lights and turn right at the next (sign-posted 'Cheadle A560, Stockport County FC') onto the A560 towards 'Ye Olde Woolpack' pub. After 1.1 miles, turn left (no signpost, by the 'Farmers Arms') onto the B5465 Edgeley Road. After approximately 1 mile turn right into Dale Street at the traffic lights and take the second left into Hardcastle Road for the stadium. Follow the M62 onto the M60 and continue south. Exit the M60 at Junction 1 (sign-posted 'Stockport Town Centre'). At the roundabout turn left following signs to Cheadle A560 into Hollywood Way. At the roundabout, follow signs to 'Cheadle A560' also 'Stockport County FC' into Hollywood Way. Go straight on at the first set of traffic lights and turn right at the next (sign-posted 'Cheadle A560, Stockport County FC') onto the A560 towards 'Ye Olde Woolpack' pub. After 1.1 miles, turn left (no signpost, by the 'Farmers Arms') onto the B5465 Edgeley Road. 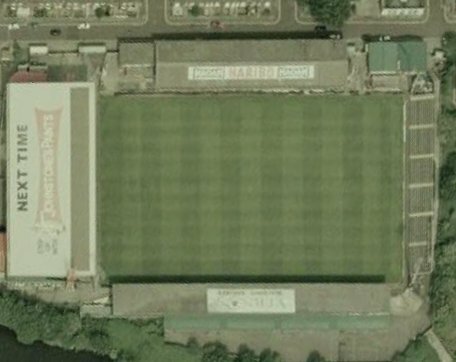 After approximately 1 mile turn right into Dale Street at the traffic lights and take the second left into Hardcastle Road for the stadium. Follow the A6 towards Stockport/Manchester. 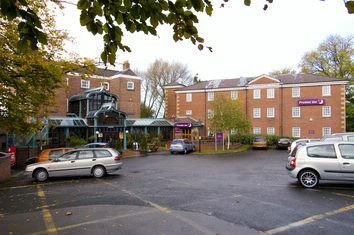 Continue along A6 until reaching major traffic lights at hazel Grove alongside the 'Rising Sun' pub. Follow signs for Stockport Town Centre along the A6 for approximately 2.8 miles, until reaching the traffic lights by 'The Nelson Tavern' and the Town Hall. Turn left (sign-posted 'Cheadle, Stockport County FC') into Greek Street. At the roundabout after 0.3 miles take the second exit (sign-posted 'Cheadle A5465') onto Mercian Way. Take the second left turning into Caroline Street for the stadium. 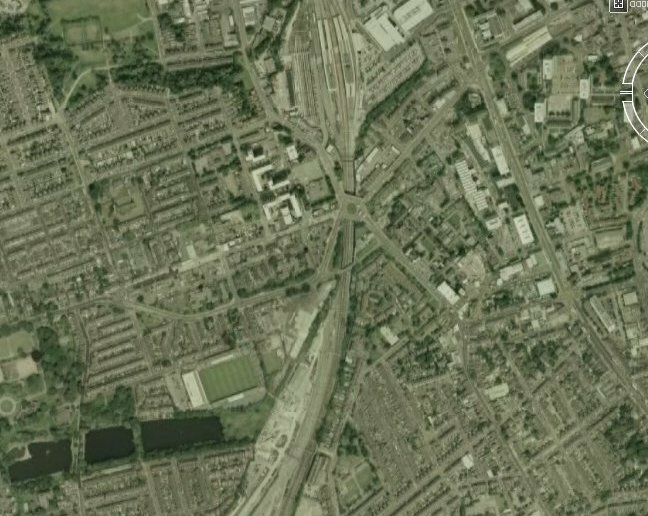 The nearest train station to Edgeley Park is Stockport Railway Station which is about half a mile from the ground. The club's official car park at the rear of the Cheadle End is not available on matchdays so it's advised to use the precinct car park off Castle Street. Email us to recommend any local attractions near to Edgeley Park and we will list them here. The Royal Oak in Castle Street has been recommended for away supporters. Email us to recommend any pubs and restaurants near to Edgeley Park and we will list them here.